Name of the organization and its EIN. Contribution details – what type, amount, or description of the contribution if it is not money. Good faith statement of value of value of goods and services. A statement that no goods or services were provided, or that if any intangible goods or services were provided, they were in the form of intangible religious benefit. Donors are responsible for obtaining a written acknowledgment for any contribution of $250 or more before the charitable contribution can be claimed on their tax return, meanwhile, the charitable organization is required to issue a written disclosure to a donor who receives goods or services in exchange of a single payment in excess of $75. 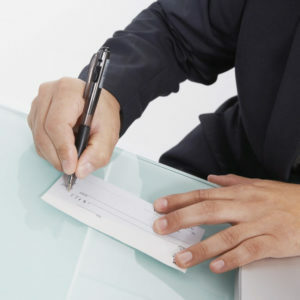 Often times, a charity accepts a donation in exchange for a sponsorship where a business sponsor receives some type of acknowledgment or advertising. We often see this in form of a business logo on the back of a program or t-shirt. But sometimes the value of the advertisement is more substantial, and would need to be accounted for in the receipt for the donation. If the donor/sponsor were permitted to post a banner at charity events, the value of the banner or advertising should be deducted from the amount of the sponsorship to determine the value of the contribution. This rule gets more complex and can subject the charity to unrelated business income tax if the charity appears to be promoting a certain business, as such when a charity allows a donor to advertise its business on its website by providing a weblink to their business. If a charity promotes a donor/sponsor’s business in some way that contributed to direct sales to the donor/sponsor, this could expose the charity to unrelated business income tax. For example, if the sponsor is permitted to post a direct link to their business on the charity’s website, and the business link directs the audience to the business’s webpage where it sells a product or service, the charity could be responsible for unrelated business income tax for the portion of sales that were directly resulting from the link. While this seems like an attenuated cause of the business’s income, and an unintended result of a sponsorship, it is something that charities should keep in mind as they embark on these programs. Charities should observe some caution when providing goods and services to donors and sponsors. Failure to do so could result in unintentional taxable income to the charity, and tax penalties to both the donors and the charity alike.